It's Tuesday and boy is it hot outside! I've taken a break from posting often, but hope to put more songs up soon. Summer is here and I've been working, traveling, and escorting the little one back and forth to swim lessons. So, for today's Therapy Tools Tuesday, I wanted to post about one of my most important and most used therapy tools...my guitar! This was not my first or second guitar, but I purchased it last fall and really love it. This guitar is the Yamaha APX 500 model. It is an acoustic/electric guitar with a 1-way pick up system (built-in tuner and 3 band EQ included). It has a thin profile and the strings are very close to the finger board, making it easier to play. It is often called a "Slimline". 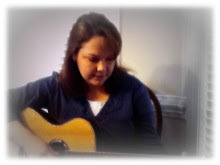 The guitar has a great sound, in my opinion, and is great to use as an acoustic guitar in therapy settings. I also play the violin and find the string height to be wonderful on this guitar. Stop by later this week for a song or two. Until then, have a great day!